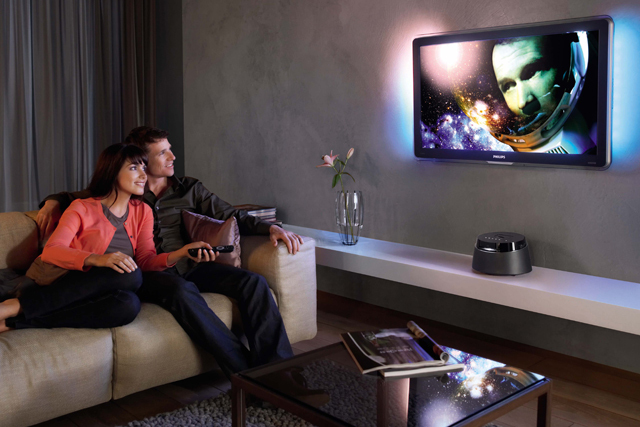 Only half of connected TV owners bother to connect their TV to their internet, writes Steve Evans, research director, entertainment & technology, Harris Interactive. Every year for the past few years seems to have been heralded as 'The year of connected TV". Yet arguably it is yet to emerge as such. What is the current state of connected TV in the UK today? Will it take the launch of the long rumoured new television set from Apple to make 'The year of connected TV' a reality? Let’s pause to consider the connected living room. The traditional online space on desktop/laptop is dominated by the likes of Google, Microsoft, Apple and Facebook. The smartphone space is mature, growing rapidly, and the tablet arena faster still. But the race for capturing the connected living room remains wide open, a space potentially even more lucrative given the captive, attentive audience, coupled with that huge, high definition screen in the corner of the room, ideal for content, services, apps, advertising and branding. Whoever captures this space to be the hub of the connected experience, to be the platform from which to deliver content and advertising, will reap a potentially huge reward. If the rewards are huge, then why have we heard the proclamation that "this year will be the year of connected TV" only to hear it repeated a year later? Firstly, connected TV ownership remains in the minority. Market estimates differ, but a 10% penetration level seems a conservative estimate. Secondly, it’s not just a low, albeit growing, penetration level that is holding connected TV back. An online Harris PollTM survey from Harris Interactive* asked a representative sample of GB consumers aged 16+ all the relevant questions to find out why. We seem inextricably connected to the web, whether it’s on a PC, laptop, smartphone or tablet. But when it comes to connected TV, we seem to take it or leave it and few of us use it on a regular basis. It certainly isn’t yet 'The year of connected TV' according to these Harris figures. Why does connected TV seem to have such a weak grasp in our living rooms? Those who don’t or have stopped using it told us in the survey that they just don’t need it and that the services are better offered by the notebooks, smartphones and tablets on our laps, that it is too technical to use or the services they really want aren’t available. It just hasn’t taken hold for most owners, let alone for the rest of us. With that beautiful HD screen, why shouldn’t a connected TV experience be as deep, broad, intuitive and rewarding as that found on a tablet? It’s not all negative. There are a minority of users for whom connected TV has become a very important channel of their viewing content. Almost a quarter (24%) of those owners who use it rate the experience as 'extremely good'. It is also true to say that connected TV services and interfaces are getting better and better with each year’s new set launches. But, on balance, the current barriers and issues with connected TV outweigh the positives and attractions. There is no doubt that the connected TV, in some shape (whether built-in or via set-top box), will be an important part of the living room in the near future. In fact, 75% of the general public agree, "in the near future, nearly all TV sets will be connected to the internet", and this increases to 95% agreement among owners. While it has yet to capture the mainstream imagination, one company that has a solid track record of moulding consumer demand to technological innovation is Apple. The long rumoured Apple television set could be the impetus needed to kick-start the connected TV revolution. And this should be a concern to other television manufacturers. Apple has zero market share in this space right now but they had precisely the same share in the mobile sector the day before they launched the iPhone. They have a track record of doing it right, getting the user experience right, making beautiful hardware, all with that Apple swagger. Right now when we ask the public, "Who would you trust to make ‘the best’ connected TV? ", Apple trails Sony, Samsung and Panasonic. Apple would have been equally likely to trail the likes of Nokia prior to launching the iPhone had we asked the same question about smartphones. Should Apple release a connected TV at a competitive price, then traditional manufacturers beware. Let’s also consider Google and Microsoft in this space. The former’s recent launch of Google TV and tie-up with Sony in the UK is something to keep an eye on, although there is no track record of success to date across the Atlantic. Microsoft has exciting plans in store, but all this connectivity is likely to have the Xbox 360, upcoming Xbox 720 and Surface as the hub rather than built-in to the set itself. "There’s an App for that" is a phrase that rings true and highlights the ubiquity and user friendliness of apps, games, services and media on your typical smartphone and tablet. Connected TV has the ability to do likewise but to date the use of the connected TV as a portal for everything is far from realised. Things are improving each year, but right now this is a key reason why more people are using their phones and tablets to access what they need, leaving the ‘connected’ TV unconnected. The internet has an incredible amount to offer and yet connected TVs allow access to only a fraction of what’s possible. While not all of us will want our email and Facebook feeds on display in the living room for all to see, there is so much more the internet has to offer that connected TVs aren’t supplying. Put simply, the connected TV makes too limited a use of what the internet has to offer. Most of the newer connected TVs feature tablet and smartphone compatibility but exciting initiatives like Microsoft Xbox’s upcoming SmartGlass and Nintendo’s Wii U hint at a future where the second handheld screen becomes an integral part of the main screen experience. While these two initiatives are locked down to a games console, connected TV makers should take note to keep up with such innovations. That second screen can be much more than a remote control. Each new generation of connected TV improves dramatically. To date the interfaces have been functional and, in some cases, even ugly. Beautiful and intuitive interfaces are much more than an aesthetic consideration – they pull people (particularly early adopters) in and encourage use and exploration. Most connected TVs offer DLNA support and most newer models have catch-up and on-demand service integration. But connected TVs being a true hub of all your family’s media, including videos, music and photos, pulled in from different devices? This is still a work in progress for connected TV. Gaming embedded on connected TVs has been to date a fairly miserable experience. Cloud gaming powered by remote servers could change this, and radically so, allowing console quality games to be streamed to the TV set without the need for a console itself. While there are concerns about streaming lag, there’ll be myriad games that will work extremely well and further increase the stickiness of the connected TV experience. Voice and gesture control, as pioneered by Kinect, could revolutionise the way we control our living room experience and throw away the need for the remote control. This report highlights that the general public are yet to really embrace the idea, but most current users of connected TV services are much more in favour. Connected TV is too difficult to use right now, so initiatives like this could help a great deal. Camera-based recognition of who is viewing (and understanding their preferences) is another exciting area of development allowing for a much more personal experience in front of the TV set. The Apple TV set-top box has been, at best, a moderate success, certainly far from the phenomena that are iPhone and iPad. A full TV set from Apple has been long-rumoured. If it does appear, one thing that is almost certain is that points 1, 2, 3 and 4 above will be executed beautifully. That might really shake the market for Connected TVs. The full Harris Interactive report on connected TV (below) includes more information on the type of services and apps that the public, including owners, would most like to see on a connected set. *Results were taken from a May 2012 robust quantitative survey using the Harris PollTM Online Omnibus among 2,095 GB respondents aged 16 or over. Harris Interactive is a full-service, consultative custom-market research agency working internationally from offices in the UK, Europe and the US. Steve Evans, research director, entertainment & technology, Harris Interactive.